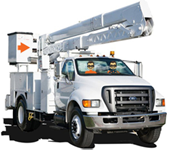 Utility Equipment Parts, LLC (UEP) is a family-owned business. Our pledge is to provide prompt, responsive service … guaranteed every day. We understand that a down truck hurts your business and we commit to being there to answer your call or email. Our goal is to make you a repeat customer, like over 90% of our current customers. United States and its territories — Puerto Rico, Marianas, Guam, etc. We offer parts and accessories for over 30 manufacturers and aftermarket parts too. Everything from large parts for cranes to small bucket covers. Warranties are product specific — most manufacturers offer limited one-year warranties. For larger orders we accept wire transfers to our bank account. We also offer Net 30 payment terms upon credit approval. Once your order has shipped, our accounts receivable department will send an invoice via email or regular USPS mail if you prefer. The invoice will show the status of the order. If paid by credit card, the invoice will show “Paid.” If Net 30 terms apply, the invoice will show the due date. certain items the US Postal Service is the best option. Overnight shipping is available for most items. All returns must be pre-approved, and be within 60 days of the shipping date. A restocking fee may apply. For credit card orders we will refund the charge to your credit card; for cash orders a refund check will be issued. In both cases proof of refund will be sent to you. We welcome your questions and comments. If you are seeking a price quote please call or email. Online: use our web form.